This is a complete guide to recover deleted files in Windows. In this tutorial you can find out 6 effective solutions to restore deleted files in Windows 10/8/7/Vista/XP, including how to recover deleted files from Recycle Bin, hard drive, SD card, USB drive, crashed computer, etc. Free download file recovery software and get back deleted files now! Why deleted can be recovered in Windows? Method 6: How to recover deleted files with PartitionGuru bootable disk? "I'm trying to restore some deleted files from an old external hard drive. Those files are mainly videos and audios and they got deleted by accident, I downloaded several recovery apps and did a quick scanning for the hard drive. After scanning, I was asked to save files to another hard disk and I had to buy the software first. It's OK to buy software, but I cannot make sure if my files can be recovered correctly. Does anyone know anything about how to recover deleted video files? Is paid recovery software able to restore them correctly?" You must have experienced similar situation that you deleted files by accident from Windows and really wanted to get deleted files back. 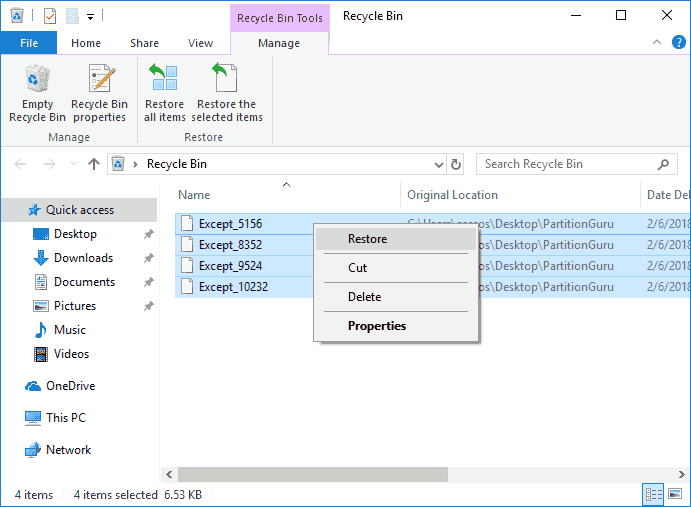 Files might be deleted by Shift+Delete, emptied from Recycle Bin or removed from USB drive, and you cannot restore them directly from Windows Recycle Bin. It seems that you can do nothing when it comes to recovering deleted files. The good news is that in most cases you can undelete files in Windows. Files are deleted from USB flash drive, SD card, external hard drive, pen stick, etc. You may wonder what kind of deleted files can be recovered. First, the most recently deleted files. When you realize that something important gets deleted, it's best to recover it as soon as possible. Deleted files are likely to get overwritten as time go on, as users may write new data, operating system generatea writing operations, etc. Second, you can retrieve lost or deleted files backed up to OneDrive or other devices. If you keep a backup on OneDrive or other storage devices, you can restore lost data easily. Third, files put in Recycle Bin can be restored before you empty it. Since deleted files are recoverable in most situations, there is no need to be panic when you face such problem. The following content will show you how to recover deleted files in Windows. You must have wonder that why deleted files can be recovered in Windows even after emptying the Recycle Bin. In fact, the reason is quite simple to understand. When a file is stored on hard drive, information recording the file's size, name, location, type and so on is saved in a place, while file content is saved in a different location. How does operating system read the file you stored? It reads the file information fitst so that it can locate corresponding file content on storage device. If the file gets deleted, only the relevant information is deleted, and the real file content still remains. The reason why you cannot see the deleted file is that system marks sectors occupied by file content as Free, so that new data can be stored there. Therefore, deleted files are still available on hard drive before they get overwritten with time you store more data. File recovery software can extract data remaining on free disk sectors and restore them for you. In situation like this, if you want to completely wipe a hard drive or other storage media, you should take extra steps to erase all sectors. Deleted files are recoverable before they get overwritten, so you should try to protect lost data from being damaged. Do not add more data or edit existing files on your hard drive to prevent any possible writing actions. Data recovery software or experts cannot recover overwritten files. If files are totally overwritten, you can restore nothing; if a file is partly overwritten, it cannot be recovered correctly, for example, recovered files are corrupted. You can recover deleted files from USB drive, hard drive, virtual disk, SD card, flash drive, etc. but you cannot do that on SSD, as SSD employs TRIM technology which completely deletes files and makes file unrecoverable. If lost files were stored on system partition such as desktop before deletion, you should shutdown system as soon as possible, and recover data under WinPE environment or connect hard drive to another PC. Try file recovery software before you decide to buy it. Most paid software provides a trial version which allows you to scan and preview lost files, and helps you make sure whether files can be recovered correctly. Step 1 Open Recycle Bin on your computer by double-clicking its icon on desktop. Step 2 Look for files and folders you want to restore and select them. You can filter files via file name, deleted time, original location, size, etc. Step 3 Right-click on selected files and choose "Restore" option and files will be restored to their original location before deletion. Step 4 View restored files and check if all your files have been restored properly. On the occasion that you cannot find deleted files in Recycle Bin, you'll either have to use a backup or third-party recovery software to get back deleted files. 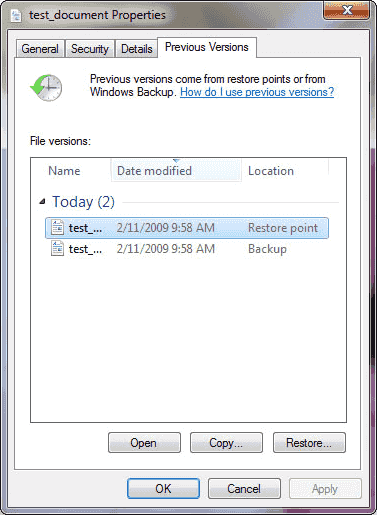 In this section, we'll show you how to restore deleted files from a Windows backup. If you do not keep a backup, you should move to Method 4 and Method 5 to learn how to get back deleted data using recovery software. Step 1 Click Start menu and click Control Panel where you can find and click System and Maintenance. Step 2 Click Backup and Restore and select Restore my files. Then you can follow the wizard to restore files from backup. Previous versions, also referred as shadow copies, are copies of files or folders which are created in Windows as a part of restore point. It is another kind of backup created by Windows system. If you have such backups, you can try retrieving deleted files in this way. Honestly speaking, this way works and you can try your luck. Step 1 Open Windows Explorer and find the folder that contained deleted files. Step 2 Right-click on the folder and select "Restore Previous Version" option. Step 3 Now you can see a list of available previous versions. Select the version you want to restore and click Restore button. 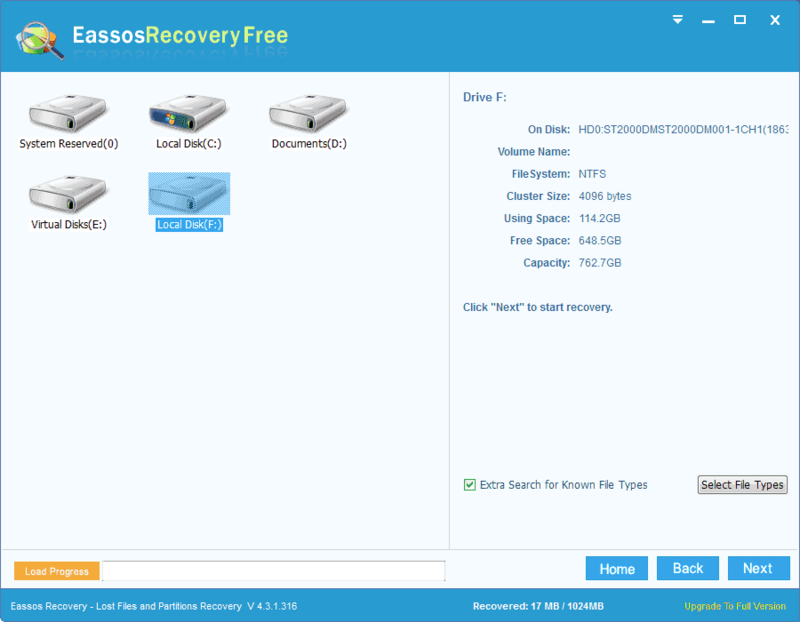 If you've tried first three solutions and still haven't been able to restore deleted data, you can try free recovery software Eassos Recovery Free which stands a good chance of getting back lost file. 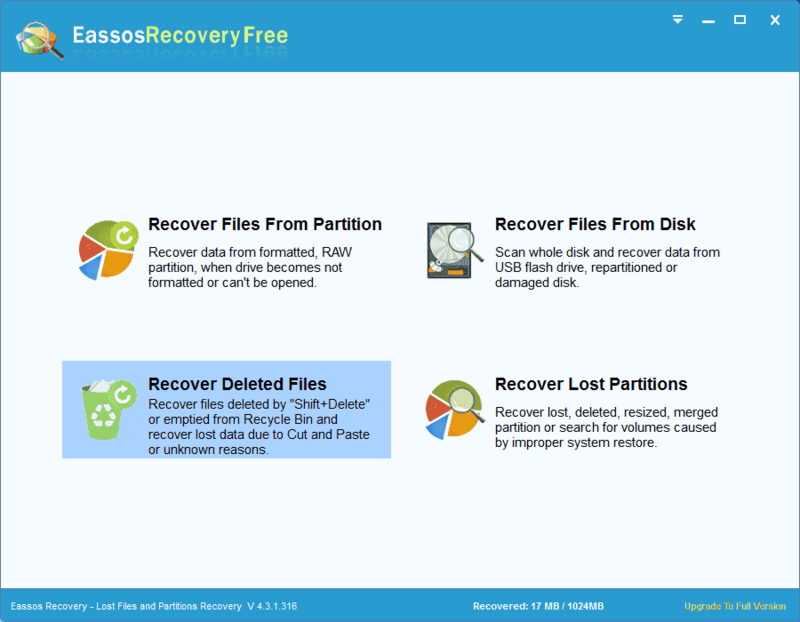 Eassos Recovery Free is free data recovery software which is designed for Windows users who want to recover lost or deleted files SD card, hard drive, USB disk, pen stick, etc. The recovery process is read-only and does not cause any writing actions to original data or location. Step 1 Download, install and run Eassos Recovery Free on your Windows computer. From the main interface, you can see supported data loss situations. Step 2 Select Recover Deleted Files option which is designed to undelete files. This option allows you to recover deleted videos, audios, documents, photos, apps, email, archives, etc. from selected partition or disk. Step 3 Select where to scan deleted files. 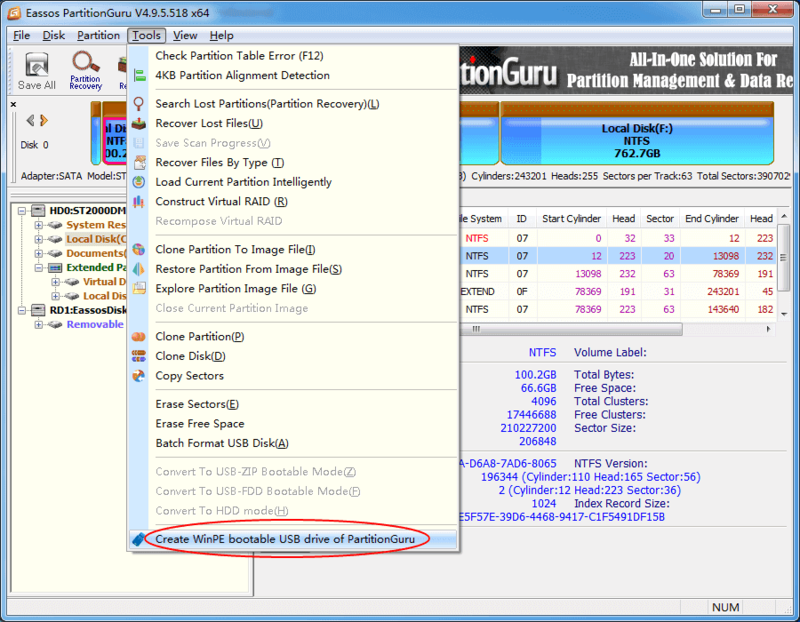 You should select the correct partition to scan deleted data, and click Next. Step 4 Preview recoverable files and locate what you want to restore. Step 5 Select files you need to recover and click Recover button. Then you can select or create a folder on a different partition to save recovered files. It happens that free data recovery software cannot find out what you want, but that does not mean your files are no longer recoverable. In such case, you can try professional data recovery software. Here we recommend Eassos PartitionGuru Pro to recover lost data, as this recovery software supports more complicated data loss issues and supports NTFS, FAT32, exFAT, Ext2, Ext3 and Ext4 file system. This Pro version provides a trial version which works the same when searching for lost files and partitions, thus you can test the recovery ability before purchase. Step 1 Launch Eassos PartitionGuru Pro once it is installed on your computer. Note: do NOT install the software to the partition where you want to recover data. Step 3 Select recovery options and click Start button. Recover Deleted Files: This option is used to search for data lost due to deletion. Complete Recovery: The recovery mode scans the entire selected disk space, and it can find out more files, such as deleted files and formatted data. Search For Known Types: This option carries a deep scanning and recovers files by file type. You can select specific file types you need. Step 4 Preview recoverable files. PartitionGuru displays recoverable during scanning and adds files to the list once scanning finds out more files. File preview feature helps users to judge if files are correct. Step 5 Save recovered files. Select files and folders you are trying to recover and right-click on them to select "Copy To". Then you'll be able to save selected data to desired location. When do you need to recover lost data using a bootable disk? There are two situations you should use a bootable disk to get back lost data. The first one is that computer cannot boot, for example, there is not operating system on your PC or Windows gets damaged. In such scenario, you cannot enter system and data recovery software cannot be launched either. Another situation is that you are not allowed to boot system in case of overwriting lost data, for instance, system partition suffers from data loss issue. If you keep Windows working, writing actions will be generated and finally overwrites recoverable files. How to recover deleted files using bootable disk? It'll be very easy if you choose a data recovery program which is able to create bootable disk. Eassos PartitionGuru, both free and pro version, can create a WinPE bootable disk with which you can boot computer and recover lost files in pre-OS environment. Step 1 Create bootable disk. 1. Insert a USB flash drive to a computer which can boot to system normally and launch PartitionGuru. 2. Select the USB drive in the software, and select "Create WinPE bootable USB drive of PartitionGuru" option from Tools menu. 3. Click OK button on the popped up window and wait for the pcocess to complete. Step 2 Boot the computer in question with the bootable USB drive. 1. Insert the USB drive to your computer which cannot boot to system and press Power. 2. Keep pressing the key prompted in screen, which might be F2 or some other key, and enter BIOS. Change boot order and make computer boot from the USB drive. Save changes and restart computer, and computer will boot from the USB drive. Step 3 Step 3: Recover lost files or partitions. 1. When your computer boots from the USB drive, the PartitionGuru WinPE version will be launched automatically. 2. Select the partition where your deleted files were stored and click File Recovery button. 3. Select recovery mode to scan selected location. After scanning, you can save recoverable files to a different drive. This guide provides 6 methods to recover deleted files in Windows 10/8/7, and now you can easily get back deleted data from hard drive, USB drive or when system cannot boot. Although the process of recovering lost files in Windows is easy, if any new files overwrite lost data you cannot get them back successfully. Therefore, it is best to have a backup of important files. You can either use Windows built-in tool or third-party software to back up data. If you have any questions or need any help, please comment or contact our support team.